A new report from American Express predicts that more consumers are set to shop online this year on Cyber Monday than in brick-and-mortar stores on Black Friday. If that turns out to be true, it will be the first time ever that the Web has beaten the mall over this critical holiday shopping weekend. Certainly, FedEx is expecting something spectacular from Cyber Monday -- It's forecasting that Dec. 2, 2013 is going to be the busiest day in its entire history, as online retailers dispatch consumer purchases. But a boom for online retailers is likely to be matched by one for online fraudsters, whose aim is often to get their grubby fingers on enough information about your credit cards to make some purchases of their own. CyberSource, a company owned by Visa, estimated that this form of online fraud cost $3.5 billion last year in North America alone. In purely cash terms, this crime isn't likely to be a problem for you. Consumers' liability for credit card fraud is capped by law at $50, and in reality few end up paying even that. Both MasterCard and Visa, for example, have zero-liability policies that have few conditions, and in effect fully protect honest and responsible consumer (though not necessarily corporate) holders of their U.S.-issued credit cards. And, writing in the Los Angeles Times on Oct. 10, personal finance columnist Liz Weston highlighted another advantage of using credit cards rather than debit cards for online shopping. With debit cards, she said, a fraudster can drain your account, and leave you having to fight to get your money back -- as would be the case with prepaid cards. With credit cards, you can refuse to pay disputed transactions until an investigation's complete, and it's the issuer whose money is on the line. However, falling victim to online card criminals can come with a high cost in stress, hassle and wasted time. So what can you do to protect yourself? Install a firewall, and keep your operating system, browser and anti-virus application up to date. Maybe try using "automatic update" services, if available. Use a pop-up blocker, or take care never to click on a pop-up window, as these can download malware onto your computer. Always log off from websites and completely close the browser when you've finished a session. This prevents someone else from accessing previous pages by pressing the Back button. Make sure you don't accidentally store any passwords on a public computer. Don't use a public Wi-Fi network for any financial transactions. It's a piece of cake for a skilled criminal to hack these. You want something that's both memorable and hard to guess. U.S. Bank suggests converting phrases that make sense to you into combinations of letters, numerals and symbols, and provides an example: "convert the sentence 'I love my dogs, Spot and Rover' to a password of 'I<3mdS&R.'" Don't use the same password across multiple accounts, especially important ones such as those for banks and credit card companies. Don't respond to suspicious emails, and never click a link in one that purports to come from your banks or credit card companies. If a financial institution suggests you have a problem with your account, access it directly in your normal way, or, better yet, call the number on your statements. Never call numbers provided in iffy emails, as you could end up talking to a clever fraudster who's only pretending to be an official. If you're thinking of buying something from a retailer that isn't a household name, first check with the Better Business Bureau and carry out an online search to make sure the company or person is reputable. Don't hand over your credit card details if you're in any doubt. Other red flags include if the browser isn't showing a closed padlock icon in its status bar, if the URL for the site's payment page doesn't show "https://" instead of the usual "http://" or if the words "Secure Sockets Layer (SSL)" are missing. The easiest way to make sure nobody's using your cards fraudulently is to check your accounts regularly. 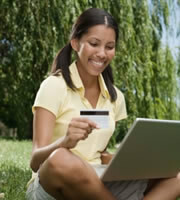 The more often you log in to see your balance and scroll through transactions, the sooner you can spot a problem. At the very least, ALWAYS open and read your statements as soon as they're available. Last year, IndexCreditCards.com explored 6 ways credit cards are better than cash, and superior protection from fraud liability was just one of those. Obviously, rewards credit cards can give your miles, points or cash back, but there are many other benefits just waiting to be enjoyed. For instance, some plastic gives you extended warranties, and price and purchase protection. So, unless you're one of those people who really can't control their spending, use your cards as much as you can this holiday season. As long as you can pay off your balance each month, or at least pay down what you're going to owe in accordance with a sensible plan, it makes sound financial sense. 0 Responses to "6 ways to protect yourself from online credit card fraud"